I will stumble, will I fall? I’ll be humbled, will I crawl? I am broken, will I be healed? I am beaten, am I torn? I’m alive, but nothing more. However comforting it might be, by its very nature, our focus on coverage can distance us from the lyrical narratives of up-and-coming folk artists and singer-songwriters. So when news came down the wires this week that 28 year old Chicago native Matt Ryd had lost his struggle with depression and stress brought on by an eating disorder, it was a harsh reminder of just how inseparable the personal and the professional lives of artists can be – and a note of caution for all of us to remember that artists are people, not just providers of song, and that even when their lyrics seem to speak loud and clear as a cry in the darkness, it’s easy to misread how truly their chosen narratives illustrate their inner demons. When we first featured Matt Ryd in our New Artists, Old Songs series in the summer of 2010, all I knew about him was what I could see and hear through his music, and the mechanics of his chosen relationship with his fans. Both were worthy of celebration: as we noted at the time, his newly-released cover of Dire Straits classic Romeo and Juliet was “a perfect case study in how simple, deliberate arrangement and sparse instrumentation can transform an original into something deliciously sweet and new.” And though we ascribed his coverage choices to a calculated attempt to appeal to the masses, the warm acoustic popfolk reconstructions of songs from Lady Gaga, Beyonce, Katy Perry and Paula Abdul he included among the gems on his mailing list exclusive cover series and his increasingly prolific YouTube sets made it clear that Ryd knew how to play, and be playful, in the 21st century marketplace. 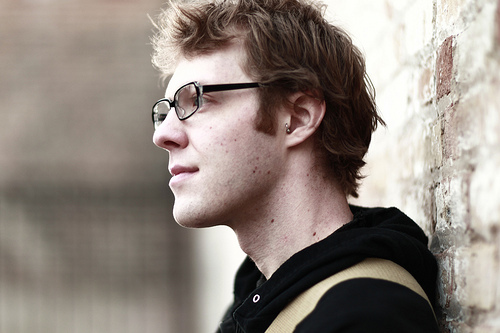 Outwardly, Matt showed all the signs of up-and-coming success: he recorded five albums between 2008 and 2013, releasing his first full-length, “Looking for Home”, to a sold-out crowd at Schubas Tavern in late 2010; his song Healed, whose lines appear above, was featured on Scrubs. Always a champion of his fellow musicians, in 2012, he formed the production company Rydmedia to produce albums for local artists. Frequent genial-yet-humble missives to his fans sustained a likability that brought us in, and kept us coming back. And his insistence on releasing all of his music under Creative Commons licensing only underscored his embrace of the modern pass-along models that drive artistic momentum today. But behind the music, Matt was suffering. Towards the end of 2012, he checked into an in-patient facility to address his eating disorder; when the insurance ran out, he left, which caused a spiral of anxiety and depression that would bring him back to residential treatment. He was open with his fans about this process, sharing a long message on his Facebook page in March of this year addressing the matter head on, and apologizing for the silence that it would produce. Matt was luckier than most: he had some insurance, and a strong support system of family and friends. But Matt’s story reminds us that mental and physical health is a heavy topic for artists in the US, where a lack of socialized medicine and a predominantly private-sector economic model for the arts writ large often leaves musicians bereft of the basic safety net that others take for granted. For the group of artists that make so many of our favorite places, experiences, and the world in general so much more colorful and interesting, lack of health care, both physical and mental, has drastically reduced our expected lifespans. I see this affecting self-employed friends and entrepreneurs every where I go. Often these are our best and brightest who choose to redesign and redefine the world around them. It seems a shame that an issue like access to doctors and medicine often can be the reason why our brightest lights go out early – it really doesn’t feel like it should be a first world problem. Though we do not always see it, evidence of the ongoing struggle to support artists in body and mind lurks behind the music we share and track here on these virtual pages. As the recent passing of indie musician Jason Molina of Songs:Ohia and Magnolia Electric Co. reminded us, drug and alcohol addiction continues to haunt many in the musical world, its temptations fueled by the hard life of touring, the raw soul of the artist, and an unhealthy popular celebration of the life of excess as the price of doing business. And sadly, mental illnesses of other sorts are rife in the creative world; most famously, the list includes oft-hospitalized bipolar musician Daniel Johnston, who we covered in a Single Song Saturday back in January of 2011. Admirable non-profits such as Nuci’s Space, which aims to “prevent suicide by providing obstacle free treatment for musicians suffering from depression and other such disorders,” fill an important need, here – but it is notable that many who suffer from depression are neither able nor willing to seek out such help on their own. Accidents and unexpected illnesses arise as frequently among artists as they do in the population at large, too. Our recent review of this summer’s tributes included If You Wait Long Enough: The Songs of Will Stratton, a benefit album for the young indie singer-songwriter and composer whose cancer diagnosis last year “illuminated the conflicted plight of artists in a world where medical bills are often unaffordable for those working outside the world of 9 to 5 employment.” And indiefolk duo Brown Bird, who have not formally recorded any covers, but whose songs are already finding substantial coverage in the pages of YouTube, remain on hiatus and functionally unemployed while lead vocalist, guitarist and lyricist Dave Lamb struggles with leukemia. In Matt’s honor, then, and in keeping with our artist-centric focus, for the next month, 20% of all donations to Cover Lay Down will be re-gifted to Sweet Relief, a non-profit founded in 1993 to support musicians who find themselves in “untenable predicaments” due to illness or disability, such as Vic Chesnutt and Victoria Williams, both of whom benefitted from Sweet Relief tribute albums and concerts. Those who wish to honor Matt directly can also give to ANAD or NEDA, a pair of support organizations that were an important part of Matt’s life for many years; those who wish to lend their support in other ways are encouraged to consider the other causes listed above. And, as always, we urge all readers to patronize the arts by buying albums, attending shows, and giving to those projects and causes which support struggling artists, the better to ensure the health and good fortune of those who explicate the world on our behalf through song. …and from a few other folk artists and singer-songwriters mentioned above, whose voices have been silenced or stifled by illness, injury, and pain. Always artist-centric and ad-free, Cover Lay Down shares new songsets and coverfolk features weekly. Want to help support our mission and the artists we celebrate? Donate to Cover Lay Down before September 20th, and we’ll regift 20% of your donation to Sweet Relief!